Showcasing the more light and humorous early work of Alfred Hitchcock, the Champagne room is truly something special. 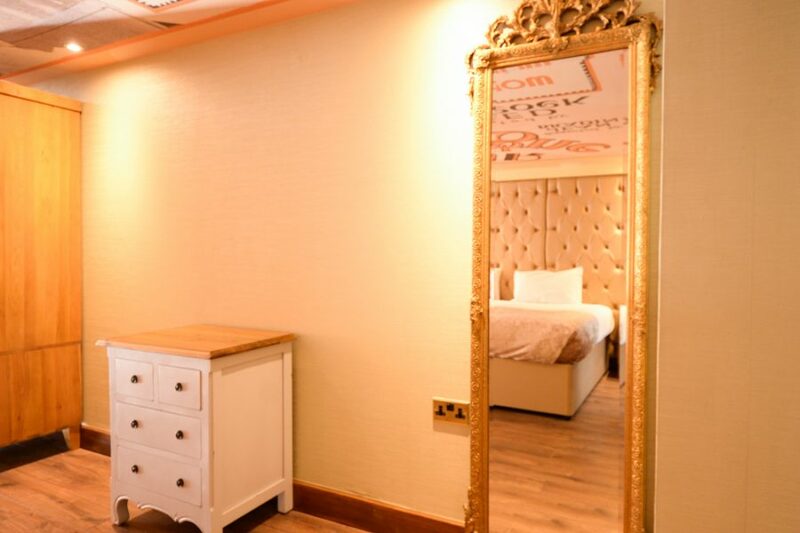 At Arthouse Hotel, our group accommodation offers more than just a hotel room. With our multiple bed rooms and luxury facilities, guests can expect a magical experience from start to finish. Only a short walk from the best sights and attractions in Liverpool, you’ll find the city’s famous nightlife right on your doorstep. 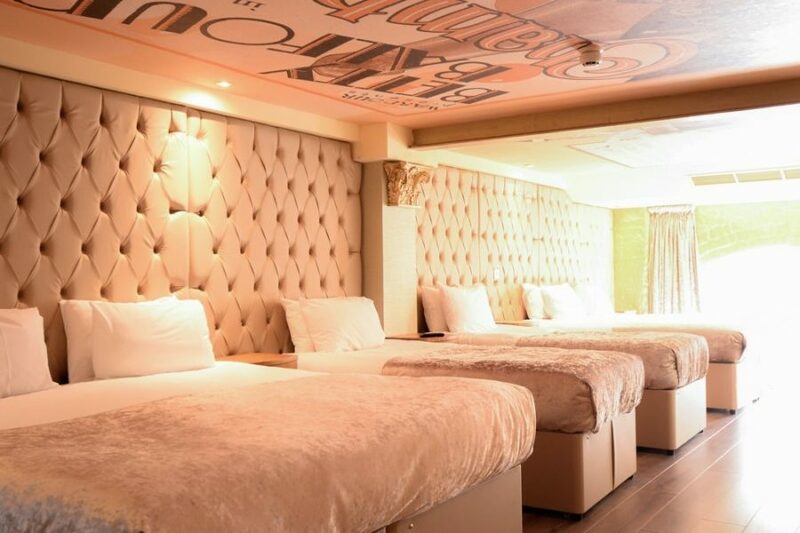 Vibrant and diverse, Liverpool’s variety of exquisite bars and atmospheric clubs can be enjoyed at your leisure, before sinking into our deluxe beds for a comfortable night’s sleep. Champagne is Alfred Hitchcock’s ninth silent feature, starring English screen actress Betty Balfour opposite English stage and film actor Gordon Harker. Filmed in black and white, Champagne is a classic piece of cinema that showcases Hitchcock’s early talents and distinctive style. Though Champagne fits nicely under the comedy genre, there are certainly fleeting glimpses of Hitchcock’s trademark techniques. With its blend of bold camerawork and foreshadowing moments of Hitchcock’s flair for horror, Champagne undoubtedly sets the tone for his dark and mysterious later work. Champagne tells the story of a privileged girl living a life of luxury from her father’s champagne business. Betty’s father attempts to bring his daughter back to earth by telling her that his money has been lost, and she can’t live from his profits any longer. Seeking out fortune for herself, Betty sells champagne in a cabaret. Meanwhile, her father hires a private detective to keep an eye on his daughter’s whereabouts and wellbeing. In stark contrast to the director’s most notable hits, this Hitchcock comedy has a happy ending, with Betty showcasing her strength of character to her father, earning his trust and forgiveness. At the time and even now, audiences are enthralled by Champagne’s unique camerawork and dazzling costumes. A silent success, the film is visually engaging from every angle. Showcasing the epitome of 20s high-life, the Jazz Age comedy is a chance to be swept away from reality into the era of flappers, fur and plenty of extravagance. Critics complemented the costume wardrobe ahead of its time, which could have fitted right into a vibrant 1930s musical. Hitchcock’s visuals prove endlessly inventive, with progressive camera movement expressing motion sickness to the audience. Viewers are transported into the film itself with Hitchcock’s clever use of blurred images, creating a visual sense of motion sickness for the audience themselves. For Hitchcock fans today, Champagne sheds light on the legendary director’s cinematic vision, and we’re sure it won’t be forgotten anytime soon. Alfred Hitchcock’s talent was noticed during the making of Always Tell Your Wife in 1923, where he was a member of studio staff for Michael Balcon, whose company was later known as Gainsborough Pictures. It took five years for the creative genius to rise from title designer to film director, while gaining experience in a variety of roles, ranging from screenwriter to assistant director. After a series of bad luck, Hitchcock struck lucky with 1927 thriller The Lodge: A Story of the London Fog. It’s no surprise that his first commercial success was classed as a suspense film, featuring Expressionist techniques that Hitchcock had been inspired by in Germany. Later known as “The Master of Suspense”, Alfred Hitchcock proved from early on that his innovative ideas would not go to waste. Daring and dynamic, the infamous director pushed the boundaries in cinema, keeping his audiences wondering about every next move. While some missed the injection of trademark suspense in Champagne, there’s no doubt that the 1928 comedy was a light and entertaining escape that kept audiences hooked. Infused cleverly within comedy, Hitchcock’s visual technique captivated viewers nevertheless.